After two and a half years of painstaking construction, research and mounting of exhibits, the provincial government of Davao Oriental invites everyone to the Subangan Provincial Museum, a site for everyone to behold. Featuring the rich cultural and natural heritage of the province, the Subangan Museum is said to be the embodiment of the soul of Davao Oriental. “This is our testimony to our people’s growth and evolution through time, a showcase of our people’s achievements and culture memento upon which our future generations can draw strength from,” said Governor Corazon N. Malanyaon whose vision led to the creation of the sophisticated edifice. 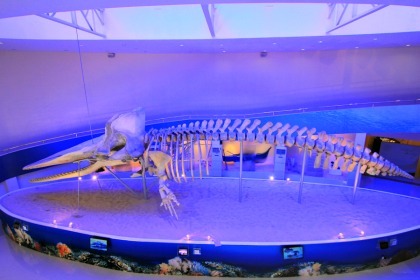 A brainchild of Governor Malanyaon, the concept of creating a museum was ignited in 2010 when a 20 ton sperm whale drifted into the shore of Governor Generoso. The 53-foot mammal which serves as the museum’s centerpiece is considered the largest in the Philippines and the seventh largest on display in the world. Gov. Malanyaon said that this exhibit reminds people of their inherent duty to take care of the environment, from the mountains to the seas. Dubbed as Subangan which means “East” or where the sun rises, the Museum speaks of eternal hope while symbolizing resiliency of the people’s determination to rise up to the challenges as what the province has exhibited in overcoming the devastation brought by Super typhoon Pablo last year, says Governor Malanyaon. Inside the museum are collections of treasured relics, photos, videos, interactive visuals, documents, fabrics, and other products, which are testaments to the province’s rich culture and history allowing visitors to experience the natural and cultural wonders of the province. One of her grandest legacy projects yet, Governor Malanyaon said that the Museum is not only a gift for the people of Davao Oriental but to all the Filipinos and the rest of the world. Assistant Secretary of the Department of Tourism, Arturo Boncatowho graced the Museum’s opening lauded the efforts of the provincial government in creating a museum which he said to be a beautiful gift to the Philippine Tourism industry and is in line with the thrust of the DOT’s Tourism Development Plan. “It is very seldom that we see a provincial government spend its time, effort, money, love and tears in coming up with a very important museum program. Apparently, it’s seldom that any provincial government in the Philippines today that actually put its heart into developing a program such as this,” he said. With Mindanao having a total of 90 museums,Boncato said that it became part of DOT’s Mindanao Communication Plan to place museums as‘inanimate spokesperson’ thatwould let the world see the real image of Mindanao as an island paradise and not as what the news dictates filled with negativity. “Our vision of tourism in Davao Oriental is to become a third generation tourist destination. It means that we have no room for the sins and mistakes of the past in developing tourism, thus it will be a picture of perfect tourism in this country,” he said.